Today I want to share about something a little bit different. It’s Father’s Day and also the day where I do a deeper dive into something I’m grateful for. I can’t think of a better topic than to celebrate the wonderful man that I’m proud to call my Dad. Dad wasn’t born into a privileged family, but worked hard to pull himself up and get an education. He was good in sports, and was well liked amongst his friends. To this day, he’s still the center of attention at most family functions and gatherings with friends. He’s famous for his jokes, and although I tend to cringe when he starts up on them, everyone else loves it. My issue, clearly. When I was young, he took me everywhere. We would go fishing (never caught much, but we had fun), go to baseball and football games, visit family, or sometimes just go offroading in the family car. I got to know just about every BBQ joint in Georgia because he was a big connoisseur of southern BBQ. I’m lucky to have such fond memories of spending time with my Dad as a kid. I realize now that not everyone has that same privilege, and for that I’m very thankful. We didn’t always see eye to eye though. As a teenager, I rebelled pretty hard. I had my reasons, but I definitely took it too far on occasion. Although there were trying times, in the end he was always supportive of me as his son. There are things I said and did that I am not proud of now, and I acknowledge that regardless of what I thought at the time, he did, and always has done his best to be a good Father and provider for his family. Dad always worked for himself, and his entrepreneurial spirit definitely rubbed off on me. I think it’s in my blood and there’s never really been a question of whether or not I have what it takes to succeed on my own. He instilled a work ethic in me that has carried through in the work I’ve done in my career. When it comes to work, there’s no such thing as just getting by, and I would like to think that his commitment to going the extra mile is something that I carry on as well. One of the traits that I admire the most about him is that he has always been someone who helps others. Even in business, he works to help people with their retirement plans and to make sure that his clients are prepared in the event of untimely deaths. He’s the most honest man that I know and would do anything in the world to help his friends and family. In recent years, we have become more close than we were in the past. He has continued to be incredibly supportive of me, despite our idealogical differences. I acknowledge that he gives as much as he can, and provides the kind of support that he didn’t always have growing up. Recently, a good friend of mine lost her Father suddenly, and it brought home the fact that we are all mortal, and we truly need to enjoy every moment that we are lucky enough to have with our families. As she grieves the loss of her Father, I’m incredibly fortunate to be going out to dinner with mine. These are the moments to cherish in life. I have a lot to learn from my Dad, and hope that I will turn out to be half the man that he is. 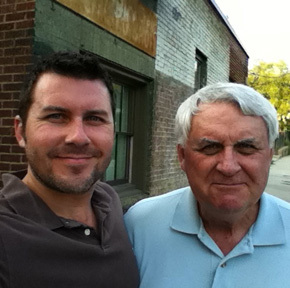 Today, I stand in humble gratitude for having this wonderful man as my Father. Thanks so much, Dad. What about you? Are you thankful for something or someone special today?